Our First RV Show – And Our First Time Looking at RVs in Person! I was really excited to attend the annual NH Camping & RV Show. Given that we’ve gotten serious about touring with an RV over the winter months, we knew we wouldn’t have a lot of options (and it wouldn’t be under ideal conditions) to look at RVs locally. And unfortunately from what we’ve found, there is only one “nearby” dealer that carries RVs we would be interested in (presumably small class Cs and class Bs, up until yesterday) – and that dealer is still over an hour’s drive from us, so with our crazy schedules, even that will take some planning. So it didn’t take too much convincing for me to convince Ross that we should catch an RV show. We’d already missed the big ones nearby like Portland, but we figured the NH show, while likely on the smaller side, would be a good start. I had a pretty clear idea in my head of what RV shows would be like (lots of people, lots of booths, pretty chaotic and less than ideal parking), but apparently Ross had no idea what he was getting into. Since I just got a church job, Ross and I drove separately to the show. Kind of a mistake. The poor guy was kind of traumatized at the crowds, so he left to grab cigarettes (and something relatively healthy for us to eat) before braving the crowds. Ross is not a crowds person. I’m not particularly, but for Ross, they incite anger and panic attacks, so it’s a bit more problematic. And in his defense, I really should have thought to warn him about the crowds. I’m proud to say that Ross handled things extremely well, articulated clearly when he needed to get outside, etc., and it was a very pleasant visit! What I liked about the show: It was straightforward to navigate. We didn’t bother looking at our maps. Turned out the show was in two buildings, but it was clearly indicated that way. They also had a nice variety of vehicles, so we could look at everything from the A-lines without a toilet or shower (yeah, not really an option for the long-term for us) to the gargantuan toy haulers that made us feel like little people. What I didn’t like about the show: $10 each was worth it, given our predicament, but would have loved if the fee was more like $5. Ross doesn’t believe in fees for stuff like that, but I do understand that the campground association needs to get their costs back. We were also really disappointed that there weren’t any class Bs, or class B+s, at all! So we’ll need to visit one in the coming months to make sure we don’t need to consider those as well. If we found a nice one with good mileage at a good price, I would love to consider it, but I think realistically for us, we’ll need more space than they can provide so we’ll need a second vehicle (or some sort of trailer) if we go with a class B – which would eliminate a lot of the fuel efficiency, but not all of it. So what came out of it? Well, we kind of fell in love with a Minnie Winnie. 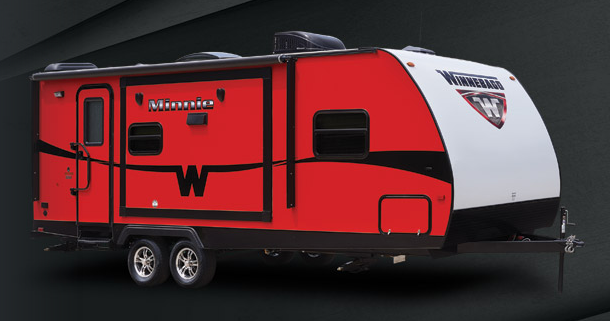 Turns out we were looking at a larger one, which had a super nice outdoor kitchen setup, but we liked their layouts overall and if we can afford it and can afford to upgrade to a tow vehicle (MAJOR ifs at this point), I think we’d happily take their smallest model or whatever we could do. It would make us pretty long with the tow vehicle, longer than I would prefer, if we went with the fancy one, but the shortest versions are about 19″ in length, which isn’t too shabby! We also really liked a smaller Winnebago class C that we looked at, which may make more sense for us. We’ll definitely be on the prowl to find these guys used or to make some megabucks in the coming year so that we can afford one new! Biggest takeaway, besides that, is that it really bugs us when RVs don’t have incredibly efficient storage built in. Upper space should get used, and if there’s a couch, we’ll probably take it out and use the space as side by side desks. Here’s hoping we’ll have enough banked to look at purchasing one next year, maybe even at the show!